A tall male Shu'halo, Pawaseh is of a lean build, with a fair amount of muscle, all covered by fairly thick coal black fur, except for parts of his arms, legs and the front of his torso, which are white. What stands out is his very long black tail, which, unlike that of other Shu'halo, reaches the ground and slithers behind him. There are a few scars on his body, but they are hardly visible. His onyx-black mane is meticulously groomed and braided into a couple of long tails, to match his braided beard. A golden ring embellishes his snout, as well as one of his short, gouging white horns. His hooves match his horns in color. Whenever he calls the elements for aid, glowing red runes will be seen on his forearms. Between the horns, two deep blue eyes scan the area around him, always on the lookout for objects and people to study. Those in the bull's proximity will no doubt notice a mixed smell of herbs, oils and metals. Pawaseh's usual attire is a long, dark red, leather garb, augmented by dragon scales, and adorned with several mementos from his adventures in Northrend and with the Earthen Ring. A large belt is wrapped around his waist, holding a series of pouches, filled with gadgets, potions, and herbs. He also carries a small teardrop backpack for his few supplies and tinkering items. Engineering goggles cover his eyes, attached to his horns. Four small totems of each element hang from a simple leather necklace wrapped around his neck. Strapped to his belt are two flaming axes, which serve more as a deterrent. Warm and friendly to those that approach him, Pawaseh tends to shy away from large crowds, often appearing as a recluse that is only focused on his crafts. He does however enjoy having company, as meeting new people is always a great joy for him. Calm and mellow, he is always level headed, so one should not expect him to display rowdy or aggressive behavior, or partake in many brawls. Getting on his nerves or angering him is an impossible task to say the least. If he displays a pair of flaming horns and glowing eyes however, expect real trouble. Due to his path in life, he borrows knowledge, wisdom and skills from his ancestors and the elements, making him quite a well-learned individual. He is neutral towards the Alliance and the Horde, no longer being affiliated with the latter, but still nostalgic over being a part of it. Often times he will be seen in a trance, communing with the elements or wandering off into the elemental plane. Other times, he will be seen tinkering with his gadgets or making potions and elixirs. When he seeks quiet time, he will likely be seen by a pond, fishing, or staring at the stars. In a burning rage, he razed the village of his mate's slayers, the home of a small Grimtotem clan that were friends of the Pyrehorn. His bloodlust ended with his hands wrapped around the throat of Otaktay, the youngest son of Mojag, the leader of the aforementioned clan. 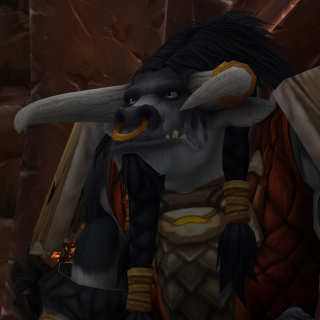 He returned to Azeroth, looking to start anew by joining the Thundermoon Tribe, although his family duties required him to disappear for long periods of time.